If you are using clipless pedals on your bicycle (and most cyclists are), it is absolutely imperative you have you cleats properly positioned on your cycling shoes. If you consider the 3 attachment points a human body has on the bicycle, this one offers little to no movement or adjustment on the fly. Riders have the ability to slide forward or back on their saddle or move their hand position on the bars at any point during the ride - but not their feet. Clipless pedals ensure that your feet are in a secure and consistent position throughout the bike ride. Over the years, I have put much time into investigating how muscle recruitment is affected by using different positions on the bicycle. Muscle engagement of the rider during the pedal stroke is vastly affected by the position of the cleats on the shoes over the pedals. For example, as the cleats are moved forward on the shoe sole, recruitment of calf, hamstring, hip flexors and low back increases over the cumulative use of the glutes. As the cleats are moved backward on the shoe, the opposite happens - glute recruitment increases as the use of the calf, hamstring, hip flexors and low back decreases. This by itself isn't a big deal. Unfortunately, nothing happens by itself on a bike ride or in training. Repeated under-use of the glutes leads to the likely imbalance of hips both laterally and horizontally. Knowing the human body is one big complicated set of levers, pivots and muscles - if those pivots ( or in this case hip joints) are different on one side vs the other, the leverage will be different - which leads to the muscle force required to move those levers needing to be different. That's a problem with a system that learns and adapts as humans do. As dual sided power meters are now becoming available, who's to say why power output might be greater in one leg vs the other? Is it simple strength inequality, unbalanced leverage, uncoordinated recruitment or simply terrible pedaling technique? The important point I am trying to make here - make sure your cleats are in the correct place. Jon starts this process by tracing the perimeter of each bare foot on a sheet of paper. Body weight should be equally distributed on both feet so as not to load one foot more than the other - as this will affect how the arch collapses under load. 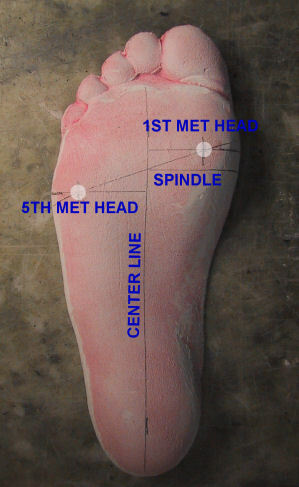 The medial and lateral heads of the foot are marked and measurements are then taken. Next, any collapse of the foot arch is noted with measurements taken in extreme cases. Cycling cleat adjustment is included in the cost of every bike fit Coach Jon offers. 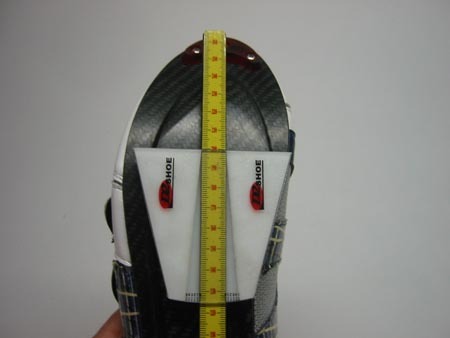 With a tool provided by the D2 Custom Shoe Company, the previous measurements are then transferred to the shoe with a mark being placed on the sole indicating this location. The cleats are then mounted to the shoes placing the pedal axel relevant to this mark on the shoe sole. Once the cleats are tightened, they are traced onto the outside of the sole in the case that the cleats need to be replaced in the future.